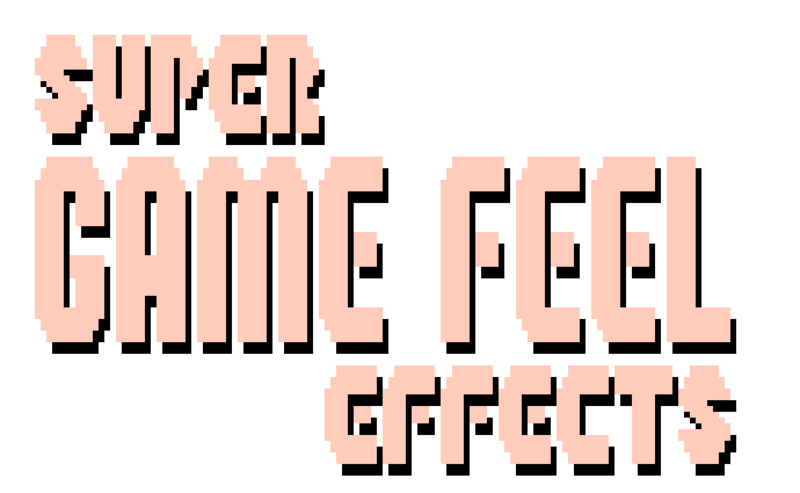 Super Game Feel Effects is a Unity tool that allows you to add game feel effects like Screenshake, Kickback, and Hitstop to a game without conflict. All effects work with other scripts. 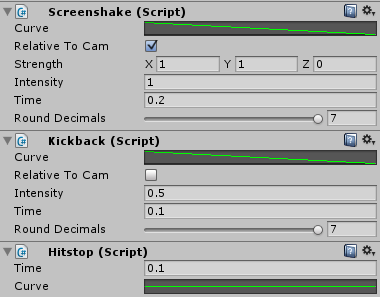 Screenshake and Kickback do not interfere with any other camera scripts. Extentions allow all functions to be called through a camera. To import Super Game Feel Effects into your project, either drag in the .unitypackage file, or get it from the asset store window. "Documentation" contains these docs! You don't need to import them, but you probably should! "Example" contains the demo scene. Not needed if you don't want the demo. "ConstantShake.cs" is a bonus script for making an object shake constantly. "SuperGameFeelEffectsExtentions.cs" allows the rest of the scripts to be called as a camera extention. The rest of the scripts are the actual Screenshake, Kickback, and Hitstop effects. To add any Super Game Feel Effects script to a camera, select "Add Component" in the inspector of an existing camera. They can be found under "Utility > Super Game Feel Effects". Screenshake, Kickback, and Hitstop can all be called through the camera they're attached to! So instead of calling "Camera.main.GetComponent().Shake()", you can just call "Camera.main.Shake()". If you want to 'store' multiple types of screenshakes on the same camera, you can call specific scripts directly. Tells the camera to shake, with the current preferences. Tells the camera to shake, with the current preferences, with a multiplier on the intensity. The intensity of the screenshake over time. The strength of the screenshake effect based on the curve, split into axises. Whether or not Screenshake.strength is relative to the direction the camera is facing, or world rotation. This will most likely want to be set to true. How long the shake effect lasts. Whether or not the screenshake effect will be rounded to a specific decimal place or not. Not rounded if left at 7. Tells the camera to kickback with a specified vector, multiplied by strength. The intensity of the kickback over time. Whether or not the kickback's normalizedDirection is relative to the direction the camera is facing, or not. How much the camera will kick back. How long the kickback lasts. Whether or not the kickback will be rounded to a specific decimal place or not. Not rounded if left at 7. Sets the game's timescale to follow the curve for the specified amount of time. Sets the game's timescale to follow the curve for the specified amount of time, with time multipied by the multiplier. The amount of time the effect will last for. The value the effect will be, over time. By default this is a horizontal line at a 0 value. If a function is called through a camera, and the camera does not yet have the component, it will automatically be added to the camera and called. The default strength/intensity for each component is set to 1, so the multiplier can be useful when using this method. "ConstantShake.cs" is a bonus script that can be attached to an object.